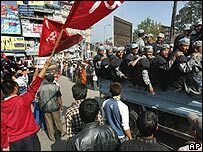 Thousands of Nepalis have held a victory rally in the capital Kathmandu after the king gave in to their demands to reinstate parliament. The seven-party opposition alliance said it had called off its weeks of demonstrations and a nationwide strike. 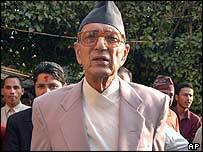 It has chosen former Prime Minister GP Koirala to head a new government. But Maoist rebels behind a 10-year insurgency rejected King Gyanendra's deal with the opposition, and vowed to continue blockading the capital. People gathered for the victory rally, waving party and national flags, and shouting slogans against the king from the roofs of vehicles. "Gyanendra, thief, leave the country," shouted some protesters who had gathered near the royal palace, saying they would not stop demonstrating until the king was stripped of his powers. Meanwhile the city began to return to normal, after a crippling strike. Taxis were back on the streets, shops were reopened, and mobile phone connections were restored. Riot police were still in evidence, though. Despite the hardships imposed by the strike, Nepalis insisted it had been worthwhile. "It is only a small sacrifice for the good of the country," said Sabita Tamang, who has earned nothing from her grocery store for three weeks. "The prices of food went up so high I had to cut down on what I eat," said Rajendra Sahi, a college student. He added: "The people have done their part. Now it is the leaders who need to do theirs." The king assumed direct powers in February 2005, saying opposition parties were failing to manage the Maoist insurgency. 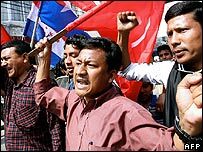 Communist Party (UML) leader Madhav Kumar Nepal told the BBC the formation of a new government would be "the first step towards a constituent assembly", which would be tasked with redrawing the constitution. But the Maoists said in agreeing the deal with the king, the opposition had betrayed an agreement it made with them in November, which called for fresh elections and an end to an "autocratic monarchy". The king's concession was "a new ploy to break the Nepali people and save his autocratic monarchy", said Maoist leader Prachanda in a statement. Until the November agreement was implemented in full, they would blockade Kathmandu and all district capitals, the statement added. Another senior rebel, Baburam Bhattarai, told the BBC: "The minimum demand is a free election to a constituent assembly." During the recent protests, the demonstrators had repeatedly defied shoot-on-sight curfews despite the deaths of 14 people. In a late-night TV address on Monday, King Gyanendra expressed his "heartfelt condolences to all those who have lost their lives in the people's movement and wish the injured speedy recovery". He added: "We are confident that the nation will forge ahead towards sustainable peace, progress, full-fledged democracy and national unity." He said the lower house of parliament would reconvene on Friday. The US welcomed the king's announcement and said he should now consider assuming a "ceremonial role". More than 13,000 people have died in the Maoist insurgency. Violence has escalated since the rebels ended a truce in January - although they declared a ceasefire in Kathmandu this month as the street protests began.